Mid-Cape Real Estate 2009: How We Preserve "the Look" - Lomenzo Properties, Inc. on the Northside what is standard fare on Route 28. These laws which include The Historic Act, also require the use of "historic" materials, designs and structural limitations. More importantly, the people who serve on committees that decide what can or cannot be built in Dennis, have done AN EXCELLENT JOB OF PRESERVING THE LOOK. Boards, such as the Old King's Highway Historic Committee, the Town of Dennis Historical Commission, the South Dennis Historic Committee and the Zoning Board, all contribute to the success Dennis has achieved. On a personal note, when we left Los Angeles and moved to the Cape 13 years ago, we left behind the West Los Angeles villages of Brentwood, Westwood, Santa Monica and many others who were being overwhelmed by trophy homes that covered literally every square inch of their lot. The lack of propriety exposed the lack of good government regulations that would preserve the natural beauty of those neighborhoods. When we attempted to bring our "California design" for a new home in our new hometown of Dennis Village, we were shot down in flames by the Historic Committee! Thank God, for what we have since discovered is that these committees are EXACTLY why we and thousands of others want to live in the Town of Dennis - because it's so beautiful here! And oh, by the way, that's when I decided to join the Historic Committee myself, ten years ago. It is no accident that Dennis has kept the look and feel of Old Cape Cod. Preserving the look helps make Dennis a very desirable vacation destination and a great place to live. 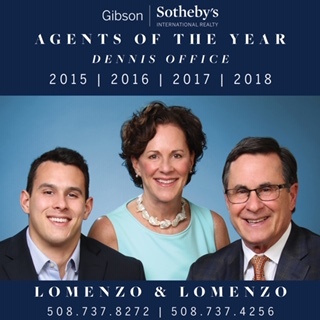 Agents Of The Year 2015,2016,2017, & 2018.